Data is an android, defined by Webster`s Twenty-third Century Dictionary, Fifth Edition, as an automaton made to resemble a human being. However, the sophistication of his neural net has elevated him beyond the status of mere machine, indeed, nobody at Starfleet fully understands the nature of his construction. 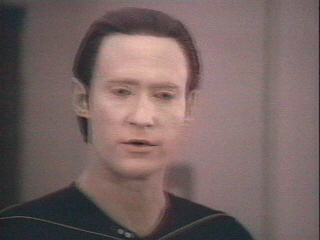 Data was designed and built by Dr Noonien Soong, Earth`s foremost robotics scientist and cyberneticist. Dr Soong`s initial attempts to realise ISAAC ASMINOV`S dream of a positronic brain resulted in complete failure, prompting Soong to leave Earth in order to continue his work in seclusion and secrecy. Dr Soong`s self-imposed exlie brought him to the scientific colony at the remote Omicron Theta star system. There he suceeded in his quest, building LORE, an advanced android which closely resembles it`s creator and which was capable of feeling emotions. However, because of his erratic behavior, Lore was percieved as a threat by the colonists, and Soong dismantled his creation. But with the knowledge he had gained. Soong went on to construct DATA, Externally identical to Lore, Data lacked the capacity to feel emotions, at least initially. Data became operational in 2338. His earliest recollections are vague impressions of some of his functions being tested in Dr Soong`s work area. Data also possesess the combined knowledge of 411 colonists, though not their complete memories. He is not certain why this knowledge was given to him, though he recalls it was done hurriedly. It is likely to have been connected with an attempt to have something survive the onset of the CRYSTALLINE ENTITY, which was responsible for the deaths of the Omicron Theta Colonists about the time of Data`s construction. As Data explains it, his final rememberance of the colony is "is of great danger. Something sudden and not understood...then a blank, as if all the colonists were gone." Data`s history really began with his discovery by a landing party from the cruiser U.S.S.TRIPOD- a vessel sent to investigate the apparent disappearance of the colony. The signal device which led the landing party to the colony was found beside Data`s body, and it is believed the same device reactivated him as thet approached. His first clear memory is of opening his eyes and looking into the eyes of the Tripoli landing party. In human terms, Data has been born and had become fully knowledgeable at the same instant, he had no idea that this was unusual.